As I may have mentioned (boasted) in previous posts, Andrew has been making very heavy hints about wishing for more pasta to feature on our menus … by buying me every conceivable piece of pasta making kit to attach to my beautiful KitchenAid. Not that I am complaining – I love pasta, and I love cooking new recipes … so it gives me the perfect excuse to buy more cookbooks (which, I do recognise, has become a bit of an addiction: as you can see from my bookshelves, where the entire bottom shelf and half the second shelf is filled with cookbooks). My new piece of kit was a pasta dough roller and cutter which attaches to the mechanism of my KitchenAid so that I can roll the dough without having to crank a handle – very handy as you do really need two hands for the job – one to feed the dough into the roller, the other to collect the thinned dough sheets from underneath the roller. Last time I made dough, I used a mixture of flour and semolina with the eggs. This time I decided to try a simpler mix of just flour and eggs. Using my Clarence Court Burford Browns, I got a beautiful yellow coloured pasta from the golden yolks. With the KitchenAid, it’s also possible to use the dough hook attachment to mix the dough, so it’s really not labour intensive. In fact, the longest part of the preparation is leaving the dough to rest for at least 30 minutes. 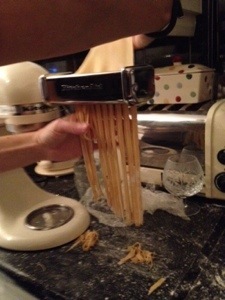 If you didn’t have to do that then you could easily make fresh pasta to have for an after-work dinner. I halved a pasta recipe for 6 people – so 300g 00 flour and 3 eggs … thinking that would be enough for Andrew and me to have a greedy large portion. In fact, that is easily enough for 4 people, so next time I’ll do 200g flour and 2 eggs for the pair of us, and will probably still have leftovers. I also had a container of white crab meat in the freezer which we had bought at Christmas from our local fishmonger. I have blocked from my memory how much the crab meat cost. When they told me the price I nearly fainted in shock, but was too embarrassed to say I no longer wanted it (even worse, we had asked for two packets!). I didn’t weigh the crab but I guess it was around 250g – it was in one of those Chinese takeaway style boxes. Use whatever you have, and actually I think a mixture of brown and white meat would be very tasty (and cheaper!). Anyway, I wanted to use this extortionately expensive crabmeat for something delicious, and so decided to make a crab and chilli sauce to go with my pasta. 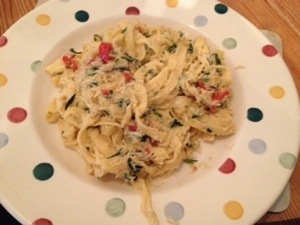 I used a mix of recipes from Nigella Lawson and Angela Hartnett, plus making up a few tweaks of my own. Unfortunately, to coincide with the gorgeous spring weather, I have got an evil cold and can basically taste nothing. Andrew told me the pasta dish tasted delicious, but I can’t be sure. I certainly should have added more chilli to unblock my nose! Make the pasta by mixing together the flour and eggs, and kneading it for at least 10 minutes until it is smooth. 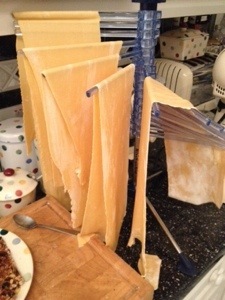 Allow to rest in the fridge for at least 30 minutes (although longer is fine) and then gradually flatten the dough through a pasta roller until it reaches the recommended thickness for tagliatelle (number 4 on my rollers). 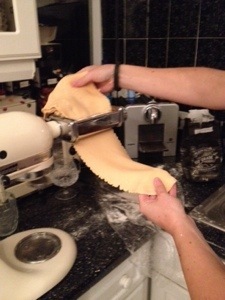 Then you need to cut the dough into lengths of tagliatelle (or whatever pasta shape you prefer). Now the pasta only takes a couple of minutes to cook, so it’s better to have your sauce started before you put the pasta into boiling water. To make the sauce, heat some olive oil in a pan and gently sweat the chilli and garlic in the oil. At this point I would put the pasta on to boil. Add the crab meat and let it warm through, and then add the lemon juice and a little more olive oil to lubricate the mixture. 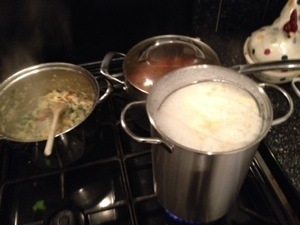 Also add some cooking liquid from the pasta to loosen up the sauce. Add the chopped herbs and then drain the pasta and mix it in with the sauce. Serve immediately. To be fully appreciated with an unblocked nose! So many things I want to say!! First…isn’t it funny how we all have a love affair with our KitchenAids? Lol.. My poor KitchenAid is so tired, I’ve had “him” for about 20 years now, and I’ve been thinking it’s time to retire him to our cabin for easy things such as whipped cream and mashed potatoes. Let him live the rest of his life in comfort… I’ve been looking at new, but trying to decide which color to buy! I had to laugh at your crab purchase, as I’ve done that myself. The shock is hard to get over, but the embarrassment of saying you no longer want it outweighs that shock!! I don’t mean to laugh at that, but I’ve been there. Completely understand. Thanks so much for your comment! All my KitchenAid goodies are in almond / cream – so pretty. But they are such a gorgeous range of colours. And whilst they are expensive, when you get at least 20 years out of them it’s worth it. 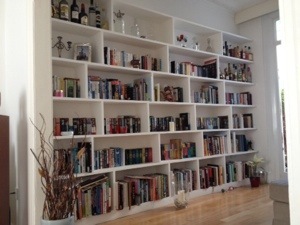 I confess I saw the shelves on a Nigella Lawson programme and asked my builder to copy them – I love them too – it’s such a little haven to sit in that area with all my books in front of me while I read or write :). I want to make some noodles next so that I can try something like your beef and broccoli recipe (no broccoli for the boyfriend though! ).